Expressive acrylic paintings expertly evoke Kahlo's style and color palette. This unique and gorgeous take on the famous figure’s work will give children an accessible entry point to an important artist. A good choice for picture book biography shelves. Not the first Frida Kahlo picture book biography and certainly not the last, but maybe one of the most successful...Plus you get John Parra’s art as an extra bonus. That guy’s amazing. 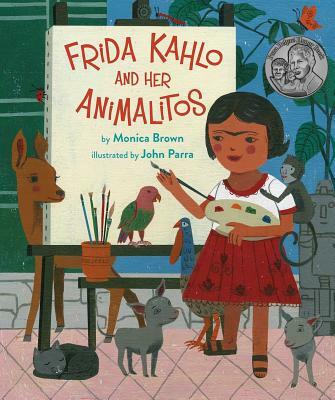 Featuring charming visuals and lively, often lyrical prose, this picture book introduces Mexican artist Frida Kahlo, interweaving biographical details while highlighting her special relationships with pets...Rich-hued, folk art–style illustrations incorporate evocative touches, fanciful details, and collagelike compositions. With their folk-art sensibility, Parra’s elegant acrylic paintings evoke Kahlo’s style, her palette and her Mexican environment, but he creates a mood of harmony with the natural world and a lively, cheerful abundance all his own.